Authorities seized nearly 10 million ballot papers destined for the vote. 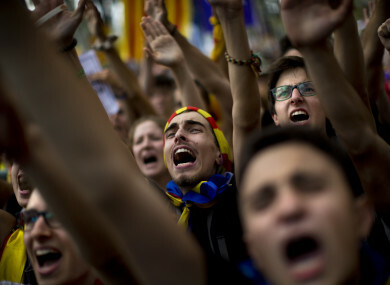 People gesture and shout slogans during a protest in Barcelona. CATALONIA’S VICE-PRESIDENT has admitted that plans to hold an outlawed independence referendum had been dealt a major blow by a crackdown yesterday, as people gathered in Barcelona for a second day of protests. Thousands took to the streets of the Mediterranean seaside city yesterday after police detained key members of the team allegedly organising the vote slated for 1 October in a region deeply divided over independence. Authorities seized nearly 10 million ballots destined for the vote, seriously damaging separatist plans for a referendum with a semblance of legitimacy, even if it was never going to be recognised by Madrid or abroad as it violates the constitution. After a day-long protest that lasted well into the night, several thousand independence supporters gathered again today in front of the high court in what influential separatist organisations said would be a “permanent mobilisation” until the officials are freed. A spokesman for Spain’s interior ministry said three of the 14 detained had already been released. Oriol Junqueras, the region’s vice-president whose deputy was among those held, told Catalonia’s TV3 television that the operation meant “the rules of the game have been changed”. The circumstances today are different because a significant part of our team, half of the economics team, has been arrested. That (the referendum) cannot be held in the circumstances that we wanted is obvious. Catalan government spokesman Jordi Turull was more optimistic, telling Catalan radio there was “a solution to all problems”. But the road ahead is complicated. Police have seized over 45,000 notifications destined for Catalans selected to staff polling stations, threatened to arrest mayors who facilitate the vote if they do not comply with a criminal probe and tightened control over the region’s finances. The confiscation of millions of ballot papers delivered an added blow to referendum plans. “Madrid’s legal response to the Catalan challenge looks increasingly likely to stop the organisation of the self-determination vote, or at least devoid it of any legitimacy,” wrote Antonio Barroso, deputy director of research at advisory firm Teneo Intelligence. In a televised statement on yesterday evening, Rajoy called on Catalonia’s separatist leaders to “stop this escalation of radicalism and disobedience once and for all”. “There is still time to avoid bigger problems,” he said. And Inigo Mendez de Vigo, a spokesman for the Spanish government, downplayed the importance of the protests. “There are more people who don’t protest than who do,” he said during an interview with Onda Cero radio. Polls show that Catalans are sharply divided on whether they want independence or not, with the latest survey commissioned by the regional government in July showing 49.4% against and 41.1% in favour. But Madrid’s repeated insistence on the illegal nature of the independence drive has generated much resentment in a region where separatists were once far fewer, with critics in both camps saying the central government has not made any attempt to win over hearts and minds. This has led to a perception that the central government doesn’t care, exacerbated by the recent economic crisis and the fact that Catalonia pays more in taxes than it receives in investments and transfers from Madrid. “I had always considered myself Catalan and Spanish,” David Barnet, a 36-year-old firefighter, said at the Barcelona protest on Thursday. But when you see that day after day they ask and ask some more, and don’t give anything in return… you get angry. While divided, a large majority of Catalans would like to vote in a legitimate referendum to settle the matter, polls show. Email “Catalan crisis: Madrid's crackdown on the independence referendum may have worked ”. Feedback on “Catalan crisis: Madrid's crackdown on the independence referendum may have worked ”.